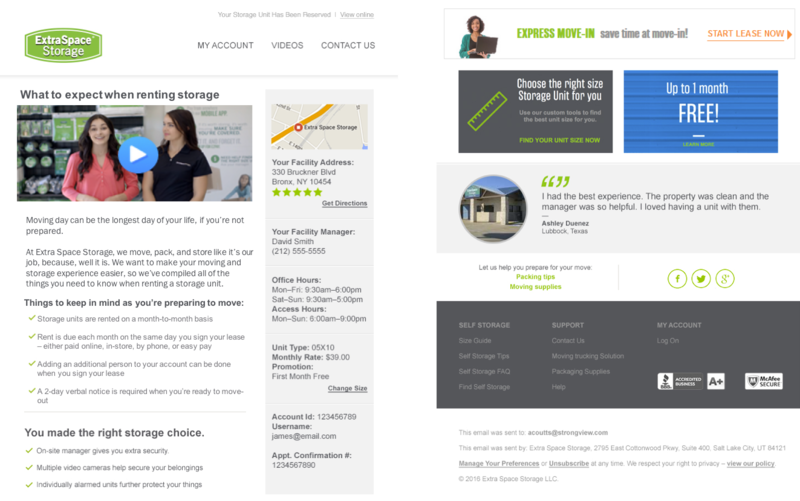 The team at Extra Space Storage knew they were missing opportunities with customers using the current business-first email program. They decided to tear it down to the studs, and rebuild it as a customer-first email program. See how they reworked templates, personalized sends and addressed customer pain points to drive a 50% jump in attributed conversion rate for email – a first in company history. 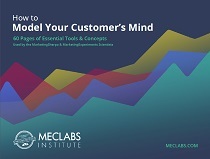 This case study is a Reader’s Choice nominee for the MarketingSherpa Summit 2017 Awards, the second of four that will be published over the next two weeks. Extra Space Storage was chosen by our panel of judges for the team’s willingness to do away with an email program that wasn’t working for their customers. Instead, launching a comprehensive email campaign that kept a focus on customer pain points, and fostering conversation. “We are here to support people when they are going through life transitions. I know a lot of people look at the storage industry and they say that it's a bunch of empty garage space, but we don't ever look at it that way,” said Jennifer Stamper, Interactive Marketing Manager, Extra Space Storage. “We know that there are strong emotions tied to the storage purchase. In other words, Extra Space Storage is storing people’s lives in our units. To alleviate the stress and emotions tied to this purchase experience, we researched to find out the main questions our customers have at the point of rental,” she said. Based on the findings, Stamper and her team created reservation emails with supporting videos to answer the questions in advance of the customer visiting an Extra Space Storage facility. 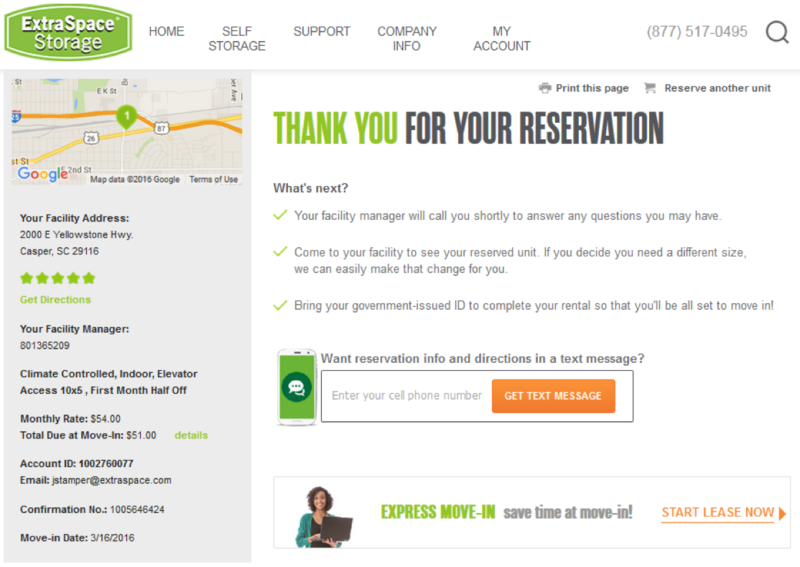 The primary goal through this email campaign was to convert reservations into actual rentals and, in turn, revenue. “For example, they don’t know how much storage they will need or how storage leases work. They are often overwhelmed by their lack of knowledge about the purchase they are making,” she said. Because of this, customers were reaching out to the call center and visiting the website at all hours of the day. “We have call center agents that go in at 5:00 in the morning and even night agents. So they're expressing a strong demand for storage, but for some reason, 45% of those people who committed to a reservation don't actually show up on move in dates,” she said. With these customer insights, Extra Space Storage needed a way to harness this data to provide increased value to each prospective customers, and existing customers alike. “Our solution was to innovate our email marketing to meet the needs of these two types of consumers,” Stamper said. Using video in email, Extra Space Storage customers were able to consume the educational video content right from their inbox, optimizing their customer experience, Stamper said. She and her team also used personalization to provide contextually-relevant value with a real-time location-based weather feed that provided move-in tips. Extra Space Storage emails up to this point were transactional and even cold, according to Stamper. “They weren't friendly. They weren't engaging. They didn't offer any support, answer questions. So we wanted to engage and connect with people and get them through the door,” she said. These issues came from being slower to adopt digital avenues with customers. As her team started building out the mobile site, they realized that there was a mobile customer base for the industry. This lead them to the realization that customers might prefer digital communications. Previously, a customer would place the reservation, and a representative would immediately call them to confirm. Then, they would call to remind them about the upcoming date. “It was a series of phone calls. This was the best way to connect with our customer base if they were contacting us on the web,” she said. Email began to be looked at as a way to still continue the conversation with customers, but “do it in a way they're comfortable with and a way that it's actually something we can leverage in our industry,” Stamper said. It was very important, she added, that this be a move that fit the company and its customers. They worked with customer personas to integrate different pieces together for a seamless email project. For that, drastic changes had to happen. “There's no nice way to put it. We gutted our email program to come up with what we have today,” she said. Stamper and her team scrapped the entire original campaign and built it back from the ground up. Stamper and her team began by revamping the email templates because they needed to become mobile focused. The email campaigns weren't mobile optimized and weren't built for the customer mindset, she said, and had to be built from scratch. “When you would pull up our emails, it was a text email with a header and a footer that was cramped into our mobile phone. You couldn't read it. So we would pull them up on our phones and say, ‘Why didn't we ever look at this before? You can't even read it,’” she said. Confirming the need for mobile responsiveness, Extra Space Storage rolled out a new mobile site in 2015 and saw a 34% increase in traffic to the mobile site. Alongside the mobile responsiveness of the templates, Stamper and her team wanted to integrate personas in the campaign to ensure overall conversion. From a design standpoint, Stamper and her team worked with an email vendor to ensure that the messaging and templates were optimized to highlight the pieces that would be most important to the customer, while still being conscious of the mobile space. Sends were based around the customer’s move in date, she said. If a customer selects a move in date that's two days out versus two weeks out, the campaigns will be different. Customers receive a reservation confirmation email immediately that goes over what the next steps are, what to expect and a thank you for the reservation. “You get those emails every other day throughout the first ten days after your reservation,” she said. Forty-eight hours before the customer’s move in date, they will recieve a move in reminder that provides all the information they need. This includes a reminder to bring their driver’s license, the unit address and as part of adding value and leveraging personalization, the email has moving day weather information in the footer. If the customer misses the move in date, there are four follow up emails after that, the first of which arrives the day after your missed move in date. This is helpful, Stamper said, because as many as 30% of customers who miss their date report still having a storage need. This email reminds them of that, and gives them an opportunity to make a new reservation. The missed move in email sends were actually a secondary test, according to Stamper, as an add-on along with the reservation solution emails. Originally with there were only three solution emails sent to customers, but “we got a lot of feedback from our field employees that our customers still have a lot of questions,” she said. Her team did a follow-up test that built out the content section further, adding emails that answered those questions and filled in any conversation gaps. The “missed move out” series was added as part of that feedback. There have been three iterations to get the email program where it is today, she added, and testing is ongoing. For example, they are testing the calls a local facility manager will make to a customer to confirm the reservation. “We've done what we call internally ‘map versus no map.’ We've actually on certain markets stripped the calls completely off and on other markets we've hired sales coaches and we've gone out and worked with employees to make the calls, to see what the customer behaviors are,” she said. From a digital standpoint, the team knows that the customers who are reserving online or engaging in emails are absorbing the information. But with call center leads, they want to connect one-on-one with a person more than they can through the Internet. “We ran that test and we found that people who placed a reservation at our call center were more likely to engage with the store manager calls than they were the emails. They still engage with the emails but not at the rates that we see from … people who make reservations on the web,” she said. They’re going to continue testing at the call center with missed move in dates, she added, and see if there’s any way to help get them through the door. Alongside this, building out functionality on the website where customers can self-serve, and make changes to their reservation. “There are quite a few different things [we want to test.] We're also looking at some different testing around our current customer communications from learning by channel. We want to take it one step further. We know our customers who interact with us through email are actually moving towards an SMS,” she said. Customers have been inquiring about getting text messages with notifications and payment reminders, which Stamper and her team will also begin testing. “That one won't be in our sales funnel, but it's something that we definitely want to leverage and see if we can move the needle with our current customers and their satisfaction,” she said. The email marketing program at Extra Space Storage has grown to as many as 1.3 million personalized sends per month. For the first time in the company’s history, there was a 50% jump in attributed conversion rate for email, according to Stamper. She and her team have to support customers with that conversation in email, Stamper added. “That's extremely valuable, and I think that applies to any organization. That's coming from somebody who didn't think email mattered in the storage industry. Nobody cares. Now … we always come back to, does it drive the conversation,” she said.